A review requested by Marc Lummis, with thanks for contributing to the Second Quinquennial Antagony & Ecstasy ACS Fundraiser. There are many indisputably great films that it's clearly impossible for any normal audience member to complete unpack in all their nuances without the aid of some highly specialised arcane knowledge, but even then, writer-director Bernardo Bertolucci's >The Conformist is a special case. It's the one and only quintessential all-time masterpiece I can name that trades, extensively, on its ideal viewer's knowledge of the history of 20th Century interior design. Cinematographer Vittorio Storaro invariably gets all of the credit, as well he might, given the relatively easy argument that The Conformist is the most impeccably-shot color film yet made. But as gorgeously lit as the film is - and that is much too weak a claim for the stunning compositions of light, shadow, and diagonal lines that dominate the film's cinematography - the engine driving the film's visuals is far less often the film's camerawork and lighting than production designer Ferdinando Scarfiotti and his team's recreation of the Modernist-derived architecture and furniture design of Fascist Italy. There is no film I know that so compellingly describes a link between the design of its world, the mentality that produced that design, and the mentality that is in turn encouraged by that design; that is to say, it is a film about the mindset of a man who wanted very badly to be a totally anonymous, perfect Fascist, and the most important way that it evokes that mindset is by containing it in distinctively Fascist spaces, distinctively Fascist compositions. And this is where I bring us back to arcane knowledge, because the simple fact of the matter is that I don't know a damn thing more about fine art under Fascism than I suppose you do (if you are some kind of design historian, I know infinitely less than you), and while the film allows us to intuit the nature of Fascist design theory, there's an enormous gap between being able to extrapolate a film's intentions versus understanding at a deep level the film's frame of reference. So now that I've made this sound like the most absolutely staid piece of entertainment you could ever hope to stumble across, let me promise that The Conformist is, in fact, a gripping piece of cinema, far more watchable than any description of its content could suggest. It's kind of a gangster thriller, if you allow that the Fascist party in Italy was kind of a gang, structured around the fluttery thoughts of Marcello Clerici (Jean-Louis Trintignant, who is in this film one of the greatest empty vessels ever performed onscreen) as he rides in the back seat of a fine car one wintry day, being driven by fellow party member Manganiello (Gastone Moschin) on a mission whose exact details only reveal themselves slowly, but which plainly cause Marcello no end of unhappiness to ponder. Over the course of the next hour and a half, this car serves as the movie's home base, while we follow along with Marcello's stream-of-consciousness recollection of his life, which largely centers on his emotionally flat marriage to Giulia (Stefania Sandrelli), a smart choice of spouse rather than a passionate one, as well as his relationship with anti-Facist mentor Professor Quadri (Enzo Tarascio) and his obsession with Quadri's wife Anna (Dominique Sanda). Viewed strictly as a psychological portrait, The Conformist is fairly blunt, overly Freudian, and not tremendously imaginative. As we see over the course of those chronologically erratic flashbacks, Marcello became aware as a preteen of his homosexual urges, and in particular had a rather ugly run-in with his family's pederastic chauffeur Lino (Pierre Clémenti) that ended with the older man dead by Marcello's hand. Absorbed by guilt and repulsed by his desires, Marcello has since spent his entire life attempting to disappear his own identity into the blank facade of a perfect conformist, behaving in the least aberrant way he possibly can, based on whatever is valued by the social order of the day. And that is, let us be honest, a bit overly schematic and just-so. Films about the sexual hypocrisy of the totalitarian parties in World War II were their own subgenre around this time, and there are those which have distinctly more sophisticated and less hoary ways of approaching that topic than The Conformist's frankly hoary appropriation of homosexuality as a metaphor (for the record, Luchino Visconti's The Damned from 1969 is my personal favorite example of the form). But who needs crafty, unexpected screenwriting, when you have this kind of extraordinary psychoanalysis through style? This is, in places, massively obvious: the film's opening scene, as Marcello prepares to commit the worst sin he can imagine, finds the lighting from a neon sign outside his room gently washing him with red at intervals. A sequence synopsising the Allegory of the Cave, punctuated with the statement that those in the cave mistake a shadow of a thing for the thing itself, ends with Marcello's shadow against a wall being blotted out by another light source, the most straightforward "his self is dissolving" image that I could imagine. Frequently, the movie is craftier than that: an early scene where Marcello spills his guts and talks about how badly he wants to be normal and nondescript takes place in a dark room, with a window to a bright white radio studio casting into stark relief just how gloomy the world that Marcello wants to disappear into is. Naked, sexualised women are shown twice in the film, both times drenched in garish, colored lighting that renders them as something almost literally inhuman and unapproachable, the feverish dream version of normalised heterosexuality that Marcello reaches for and cannot attain. And the whole movie is dominated to the point of distraction with diagonal lines in the mise en scène and the lighting, imprisoning Marcello, slashing across his world and breaking it into fragments. It is among the most Expressionist films ever made in color, both in the descriptive sense (Expressionism, as a movement, was dedicated to expressing interior emotions through exterior form - hence the name), and in the more nitpicky sense that it uses the actual graphic techniques of German Expressionism: there's a shot of Sandrelli in a striped dress under striped lighting that is the most literally Expressionist shot that I have seen in any film made after the mid-'30s. One could go through every single frame of the film and analyse how the composition, color, and lighting all reflect Marcello's mind, the dominance of the individuality-crushing cult of Fascism, or very often both. Certainly, it would go for tens of thousands of words beyond the meaningful scope of a "review" for me to fully work through every single image that I'd like to talk about - the one with the Eiffel Tower a hazy shape in the backdrop against a featureless grey sky, that's a profound emblem of isolation! The violet-selling woman singing "L'Internationale" is purposefully murky and blue to contrast against the ungainly brightness of he and his blonde mistress! Holy balls, the pullback to reveal Giulia patiently waiting as he fumbles his way through his first-ever confession to a priest, that's why they invented camera movement in the first place! - so I won't bother trying. There isn't, however, a single frame that feels accidental, anywhere in the movie: The Conformist is a dream movie for anyone who wants to play around with image analysis, just clicking around to random frames and unpack everything communicated by that shot, that pan, that marriage of visual desolation with the exquisite pain of Georges Delerue's great score, one of the best of the 1970s. 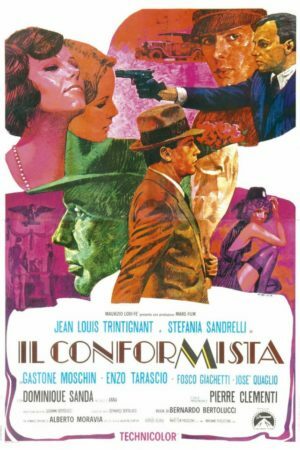 It is a greatly, audaciously cinematic movie, The Conformist is, imposingly precise in its arrangement of individual elements, and their collective shaping by Bertolucci into one grand statement about the the way that Fascism preyed upon humans and was created and bolstered by the same humans. Praising it feels a little obvious, like bothering to point out that there's some good stuff on the White Album; The Conformist is so direct and straightforward in so much of its symbolism that watching them feels like the movie has already done your work for you. But there are many layers to it, and they are not all so straightforward; I'll admit that I don't revisit this film as often as other of the great European art house classics of that generation, but every time I do, the film seems fresh and totally new, and that's the best thumbnail description of a masterpiece that I've got.